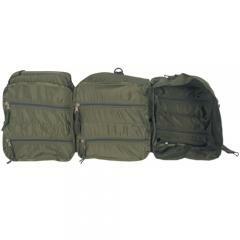 Keep important medical gear close, accessible and ready to save lives with the Military Medic Bags from Tru-Spec. Designed to handle the extreme conditions of tactical mission work, these bags are constructed from tough military-grade nylon. All seams are reinforced and the double zippered pockets provide water tight closure that will not burst when bags are packed tight. Seven separate pockets offer ample storage space for all kinds of medical equipment and also help users keep items organized and easy to find. A double-stitched carry handle makes transporting the carrier a breeze and attachable shoulder straps allow for backpack style carry. 5 stars to this medical bag it blew my mind when I first opened it all up and when I stored a bunch of first aids stuff away. I still have soo much room and it folds up and it's ready to run with.